If your home is like most in the U.S., you’re spending a fifth of your energy dollars heating your water. If your water heater needs replacing soon or you just want to reduce your energy footprint, tankless water heaters are a great investment. Also known as instantaneous water heaters, tankless units work only on demand. Rather than storing and constantly re-heating a 40- to 80-gallon tank of water and incurring a 20% standby energy loss, they fire only when the hot water is called for at a tap or by an appliance. Smaller homes are well-served with one mid-sized tankless heater, but a larger unit can provide 8.5 gallons per minute, making the cold shower a thing of the past. A tankless heater can also give a solar hot water system the boost it might need in a colder climate without using much fuel at all. 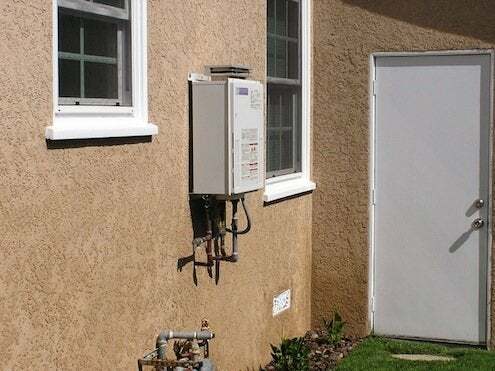 Some are electric, but gas-fired tankless units can save 40 percent over conventional electric water heaters. They hang on the wall, so you can reclaim some space in your closet or basement. and choosing a unit with an energy efficiency of .8 or more may earn you a tax credit!